Apex Magazine #80, the special reader appreciation issue of this science fiction, fantasy, and horror webzine, delivers more content than any previous issue. Also providing original fiction are Chikodili Emelumadu, Lettie Prell, Carrie Cuinn, and Jennifer Hykes. There are seven poems, by Samson Stormcrow Hayes, Zebulon Huset, Anton Rose, Greg Neunig, Annie Neugebaur, J.J. Hunter, and Apex poetry editor Bianca Spriggs. Andrea Johnson interviewed three authors: Ursula Vernon, Lettie Prell, and Chikodili Emelumadu, and Russell Dickerson interviewed cover artist Matt Davis. 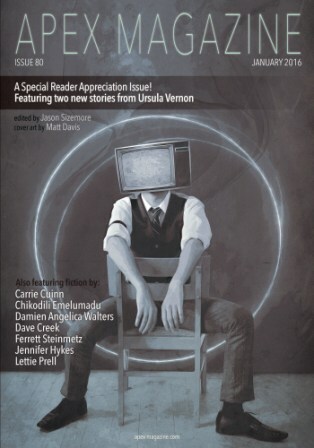 And the issue’s reprints are a short story by Ferrett Steinmetz and a novelette by Dave Creek. The free original fiction, poetry, and nonfiction will be released throughout the month on the Apex Magazine website. You can see the release schedule here. The entire issue is available for only $2.99 direct from Apex, or through Weightless Books (ePub/mobi/PDF), Amazon (Kindle), and Barnes & Noble (Nook). Subscriptions are also available on either a yearly or monthly basis. Linked items have already been posted online. Next month’s Apex Magazine will have original fiction by Benjanun Sriduangkaew (“The Beast at the End of the Universe”), Betsy Phillips (“The Four Gardens of Fate”), and Daniel Rosen (“Anabaptist”); poetry by Heather Morris, Mike Jewett, Crystal Lynne Hilbert, and Laurel Dixon; and a reprinted novelette by Nick Mamatas (“On the Occasion of My Retirement”). Cover art will be by David Demaret. Apex Magazine issue 81 will be published in February, 2016. I’ve just read The Tomato Thief, and now I really want a tomato sandwich. I’ve never had one. And it’s January, and all that’s available are grocery store tomatoes. It’s not worth it! A grocery store tomato will put you off them for life! I’ll wait until the farmer’s market this summer, and see if I can find some nice heirlooms. I love this story! I made sure to point it out to a train fan. I read the whole issue last night (yay insomnia) and I read our Wombat’s stories TWICE right away. And I hate tomatoes! But I loved it. Another chunk of the family’s from small Southern mountain towns (with hawgs), so “Razorback” worked too. It got very dusty at the end there, or I had allergies. I really enjoyed The Tomato Thief.